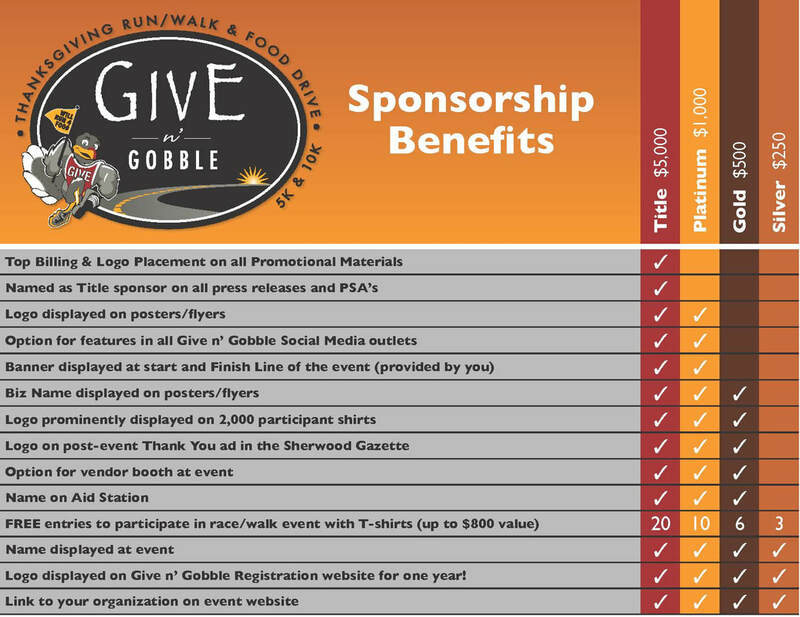 Be a Give n' Gobble Sponsor! ​The annual Give n' Gobble is a walk, run and community food drive that takes place in Sherwood starting at 9:00 am on Thanksgiving Day. The event includes at 5K walk, 5K run and 10K run. The purpose of this event is to raise donations for Helping Hands food bank. To date, thanks to the overwhelming community support for this fun and heart-warming event, we have donated nearly $300,000 plus 60,000 lbs. of non-perishable food! According to the Oregon Food Bank "every dollar you donate enables them to collect and distribute 6 pounds of food to fight hunger." With over 2,200 participants, 150 volunteers, and hundreds of spectators, this event has been widely adopted as a popular annual Thanksgiving tradition! This event allows people to come together with neighbors, friends and families to help fight hunger right here in our community while doing something healthy together. Becoming a Give n Gobble sponsor, is a great opportunity to help those less fortunate while increasing goodwill and community awareness of your business. We offer four levels of sponsorship, see chart for details of sponsorship benefits. Want to help make a difference? This is a volunteer run event, and we'd also love to have your help. Whether you are interested in just helping for a couple hours the day of the event or want to be a bigger part of the team, check out the volunteer options! Be a Hero . . . Be a Sponsor! ​"What a great turnout! Everyone I've talked with is very impressed with what you've done. Just know that Helping Hands is very grateful for all your hard work and that of your volunteers. With the money you raise for us, we now provide a lot of fresh items for the families. Things that we couldn't afford to do before. What a great community we live in."